He served as President Director of the Company based on the Annual General Meeting of Shareholders resolution on June 5, 2017. Prior to becoming part of PT Golden Eagle Energy Tbk, he has 25 years experiences in the mining world including coal, copper, nickel and mining support services and occupied several positions such as General Super intendent at PT Freeport Indonesia (1991-2002), General Manager at Tiara Marga Trakindo Group (2002-2008), Chief Operating Officer at PT Titan Mining Energy (2008-2011) and President Director of PT Ganda Alam Makmur - Titan Group (2011-2012). And has started joining Rajawali Group since 2012 and currently also occupies the position as President Director of PT Triaryani. 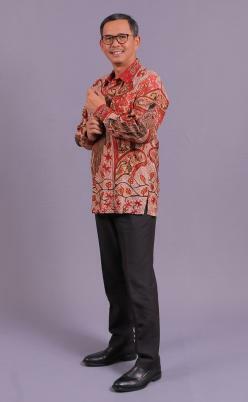 He obtained his Bachelor of Mining Engineering degree in 1990 from the Bandung Institute of Technology (ITB). And he has no affiliation relationship with other members of the Board of Directors, Board of Commissioners, or shareholders.